Budget friendly, save your hard earned money for all the Maui attractions and Restaurants. Make your Maui visit even more special with this Master Bedroom / Studio. My past Guests comments: New , Sparkling clean. Excellent, location....Well equipped with Amenities...Comfortable Bed...Beautifully decorated. Five minute easy walk to the beach, restaurants , shops, grocery, post office, fast food, gym. Your own parking space just 11 steps from your front door , no steps to climb ! The Studio is approx. 288 square feet, Air conditioned plus two ceiling fans. A ( CONVENIENCE KITCHEN ) with a new full size REFRIGERATOR , MICROWAVE, TOASTER, TOASTER OVEN , (1) burner INDUCTION COOK TOP , BLENDER, KEURIG coffee maker, Electric skillet. TOP RATED, Queen, Comfort Grande Gel memory foam 14" mattress, 3" Gel Memory foam mattress topper, 4,263, top reviews, bright white, duvet cover and sheets , Duvet cover is Ultra 'silky, 1500 thread, 8,000 top reviews, Sheets are Platinum collection 1800 series 19,000 top reviews . Pillows are Sharper Image, memory foam with cool gel. Bath towels are bright white, very good weight and size. Free , shampoo ,conditioner ,body wash. Bath has large wall fan, window for ventilation, hotel style hair dryer, medicine cabinet, hand held shower sprayer, Shower newly renovated in beautiful stylish tiles. The ceiling in the bath has a skylight so the bathroom has bright natural light during the day. First aid kit and hand mirror, X towels in bath cabinet. Samsung Smart TV, with Cable, Desk has free .High Speed WIFI , everything in Excellent condition. The Studio has a private patio ( 5 1/2 feet X 27 feet ) with lights and ceiling fan , carpeted for your comfort. It has one dining table with chairs and one small table and chairs. Fresh, beautiful living blooming orchid plants and greenery. Washer and dryer two steps out your back door. I provide free snorkels, fins, beach towels, mats , umbrella, chairs, maps. Also available to all guests is the front courtyard, BBQ, putting green, sitting area, relax and enjoy the wonderful warm Maui breezes. This is a (green) home, Solar roof panels and Solar water heater. It's a great time to visit ! Love to be your Host :) Please read my 5 star reviews. Licensed by the State of Hawaii STKM 2018-001 . No prejudice here only Aloha. I decided to move to Maui because it's such a beautiful island with all the comforts of the mainland and a low population. The weather is perfect for me. Doesn't take long to drive to the different cities, except Hana. Traffic is usually flowing except morning and afternoon rush hours. The bathroom is newly renovated. It has a ceiling sky light, bright wall lights, Hurricane, a large fan, window, medicine cabinet Oster, hair dryer. A extremely nice bathroom. wall unit, plus two ceiling fans. Private parking just steps from your front door. Eveything you will need for your stay, all in excellent condition. Sit up breakfast bar inside, and a private outside open air, patio dining table and two chairs. Free, High Speed , WIFI, or wired Ethernet . Cable TV. I have a court yard, with a garden, BBQ, seating, shade cover, all guests are welcome to use. Three blocks up from your room is the Maui Nui Golf Club on Lipoa Parkway. Close to about everything, shopping, restaurants, banks, post office, medical, drug stores, Gyms, Golf, Large State of Hawaii owned swimming pools. Grocery stores, health food store, hair and nail salons, Pacific OCEAN / beaches. Catholic church, dental, massage, coffee shops, pie shop, fast food, gas stations, nightlife, hardware store, real estate offices, farmer market on Saturday. Food trucks. Terri has thought everything out and the studio has everything you need for your stay, including extras like beach chairs, beach umbrella, and snorkel gear. The place is very clean and I would stay here again. White and clean! Patio area has locking gate, so very private. Unfortunately, road noise is only covered by running A/C unit. Limited space inside, but covered patio offers additional seating and table for eating. Terri has done a great job of providing all the basics plus extras such as beach umbrella, beach chairs, sand mats, snorkel gear, beach towels, and beach bags. This house was perfect for our vacation. Terri was very accommodating and friendly. As our vacation came to an end we were already planning when we could return and use this place again. The location was perfect and the house had everything we needed. If you get a chance to stay here you won’t be disappointed. Terri's place made us feel right at home. It is very comfortable, modern, fully furnished with many thoughtful touches that made our trip so enjoyable in Maui. She leaves almost nothing to be desired as the place is fully equipped in the kitchen, beach toys and food goodies. It is in a great location, short walk to the beach, groceries, restaurants and many other amenities. Highly recommended! Loved your story about your accommodations before you arrived at my place, I think you called it a shed in a back yard, roosters on the roof, on the , Big Island, Crazy experience !!! You got perfect weather for your friends wedding just up the street, and running around the island, can't beat that ! My highest recommendation for Terri's lovely, sweet spot in beautiful Kihei! Terri made sure we had everything we needed to be comfortable, going the extra mile with personal touches like fresh fruit, beach supplies, and local info. Terri's place is walking distance to the beach, and easy driving distance to just about everything on the island. I'd gladly return to this hidden gem if given the chance. Mahalo! Aloha and thank you for a super review. The visit to Maui was to be a romantic getaway, WOW ! What a surprise..... a engagement ! Well, I was sorry to leave! Had a great stay here and Terri is a fabulous host, always available to help out. Beautifully appointed suite, no complaints..... Very helpful to have the beach mats, chairs, umbrella and snorkel equipment to use. 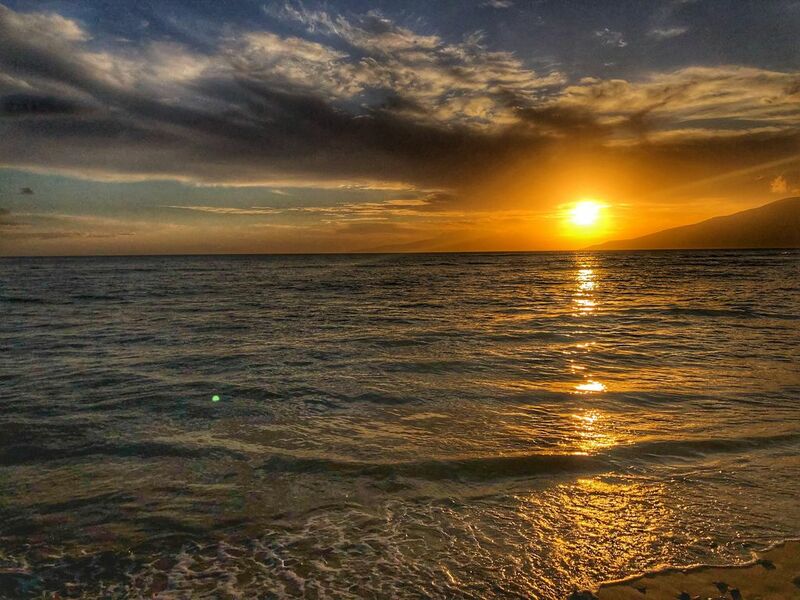 It is a 2 block walk to the best beach in Kihei. Many private homes and only 2 condos on this beach, so much less crowded than the others. Turtles came to visit most days! Ask Terri to take you to the pool bar on Tuesday nights, the best live music ever! Very close to supermarkets, liquor stores and restaurants. Terri was so helpful to me on my last day, when my Boeing 737 max got grounded, and my flight got delayed 4 hours. A relief to know I had a place to stay if my flight got canceled. Thanks so much Terri, I would book here again in a flash! It was my pleasure to be your Host on Maui. You are so talented and high energy. Beautiful home, garden, show horse, foodie, including mastering the ( instant Pot ) and hand made breads and more. You are a medical professional, jogger, traveler. You care for your precious cat that needs injections , two times per day, I'm tired just mentioning all the things you do. I could never keep up ! We had fun with the BBQ once we got it lit, very windy that day. Ribs, Banana crisp with Liliqui sauce, yum.